Every year over 300 people die in ladder-related accidents and thousands suffer disabling injuries which is why every step matters! From step stools to extension ladders, make sure you are putting the right foot forward. 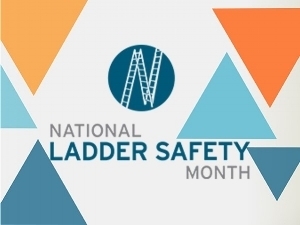 Ladder accidents are preventable and the goal of National Ladder Safety Month is to raise awareness of ladder safety and decrease the number of ladder-related injuries and fatalities. Always inspect ladder prior to using it. If the ladder is damaged, it must be removed from serviced and tagged until repaired or discarded. Always maintain a 3-point (two feet and a hand) contact on a ladder when climbing. Keep your body near the middle of the step and always face the ladder when climbing. Only use ladders and appropriate accessories (ladder levels, jacks or hooks) for their designated purposes. Do not use a self-supporting ladder (step ladder) as a single ladder or in a partially closed position. An extension of straight ladder used to access an elevated surface must extend at least 3 feet above the point of support. Do not stand on rungs of a straight, single or extension ladder. Do not exceed the maximum load rating of a ladder. Be aware of the ladder’s load rating and of the weight it’s supporting, including the weight of any tools or equipment.